Every once in awhile, Shanghai’s excitement can become overwhelming, and the soul craves an escape from the chaos. Enter Zhujiajiao (朱家角), a 1,700-year-old town located in Qingpu district 48 kilometers away from downtown – the perfect location for a daytrip or weekend getaway. While there are four ancient towns located in the municipality of Shanghai, Zhujiajiao – often dubbed the ‘Venice of the East’ due to the many canals that run through it – is probably the best preserved of them all. 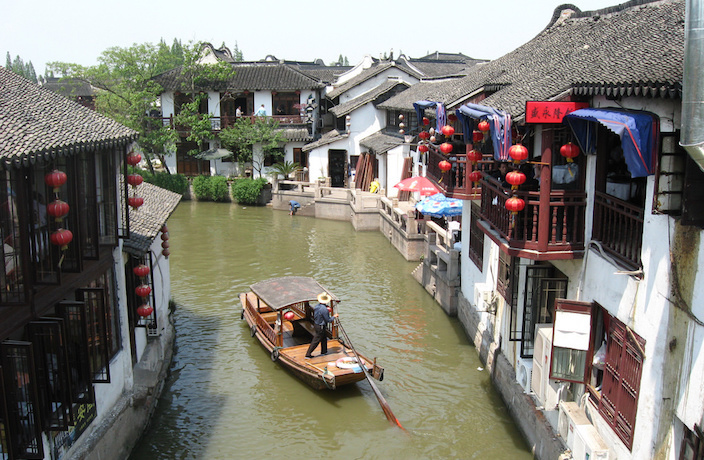 The main river, which acts as the vein of this typical Jiangnan water town, is lined with historic buildings dating back to the Ming and Qing dynasties. Dozens of ancient bridges (36 to be exact) connect the city, which are best experienced with a scenic gondola ride. Attractions such as stores selling a kaleidoscopic selection of rice and spices and post office dating back to the Qing dynasty can also be found in the side streets. Now that Shanghai Metro Line 17 is open, here's your guide to exploring Zhujiajiao, the city's best known water town. Entrance to the main town is free, but some sites have their own separate admission fees. Once you arrive at Zhujiajiao's main gate, you can purchase different packages ranging in price from RMB30-80 to give you access to various attractions. Perhaps the town’s crown attraction, this nearly 450-year-old stone bridge is the longest, tallest and largest of its kind in the Shanghai area. Eight dragons surrounding a shining pearl are engraved onto the center arch of this 70-meter-long bridge while four classic stone lions stand in the pillars on both ends. Strolling through the small shops of Bei Dajie, probably the best-preserved street of its kind in Zhujiajiao, you’ll find tourists of many nationalities admiring buildings from the Ming and Qing dynasties. Though it’s only one-kilometer long, a short walk through Bei Dajie often feels like a journey that takes you back hundreds of years. This Buddhist monastery built in the mid-1300s is located on the north end of Caohe Jie. Three main temple buildings and separate living quarters for its residents are on the premise. While it’s smaller and less glamorous than some of the other similar temples around China, Yunjin Monastery is renowned within the devout Buddhist community for having been visited by literary dignitaries who have left behind works that celebrate their faith. Built in 1912, the design of this traditional garden at the northern tip of Zhujiajiao incorporates both Chinese and European design elements. Its name – ke (meaning to learn) and zhi (to plant) – is an allegory for the importance of studying and farming. A five-story structure – the tallest in Zhujiajiao – sits in the middle of the garden. Built on the former residence of Chinese politician Chen Yun, this memorial commemorates his life and examines the history of Qingpu district. The museum is divided into five sections which serve as a biographical exhibition of Chen's life. You can take boat rides on the canal gondolas to view the town from the water. Each boat seats up to six people. Short rides up and down the main cost RMB65, while longer rides that journey across the entire town cost RMB125 per person*. Passes can be purchased at the small wooden ticketing booths found next to Zhujiajiao's major tourist attractions. *Prices are as of writing time, and may be subject to change. Constructed around a 600-year-old courthouse from Ming dynasty, Ahn Luh Zhujiajiao offers a true escape from Shanghai’s concrete jungle. For accommodation, there are 35 villas in the property, each with its own private garden and courtyard. Four of these villas even have their own outdoor swimming pool – a perfect choice for the hot and sticky Shanghai summer. Zhujiajiao is now easily accessible thanks to the opening of Shanghai Metro Line 17 in late December 2017. Zhujiajiao Station (朱家角站) is second to last stop on Line 17. To access Line 17, transfer from Hongqiao Railway Station (虹桥火车站) at the terminus of Lines 2 and 10. From there, your journey to the ancient town will take approximately 40 minutes and cost RMB6. From there, it's just a short one to two kilometer walk to the main tourist area. Another affordable way to get to Zhujiajiao is taking the Huzhu Express Bus (Hùzhū Gāosù Kuàixià 沪朱高速快线) at the corner of Pu’an Lu and Yan’an Lu (near People's Square), which takes you directly to Zhujiajiao Bus Station in about an hour for RMB12 per person (one-way ticket). Those with a larger budget can opt for a taxi, which will cost you around RMB150-200 from downtown Shanghai. This post was last updated on September 14, 2018.